The increase in Austin's pension debt over the last decade is due in part to the fact that as the population grew, demand for public services increased and the city added more than 1,000 public employees between 2010 and 2015. As the cost of providing benefits rose, the city failed to keep up with contributions to the system—skipping nearly $170 million in payments to the Employees' Retirement Plan, which is the city's largest retirement plan, over eight years. At the same time, it suffered a series of investment shortfalls system wide, which compounded the effect of the missed contributions and led to a widening gap between assets and liabilities. Despite the fact that the city is paying more and more into the plans each year, unfunded liabilities are continuing to rise. 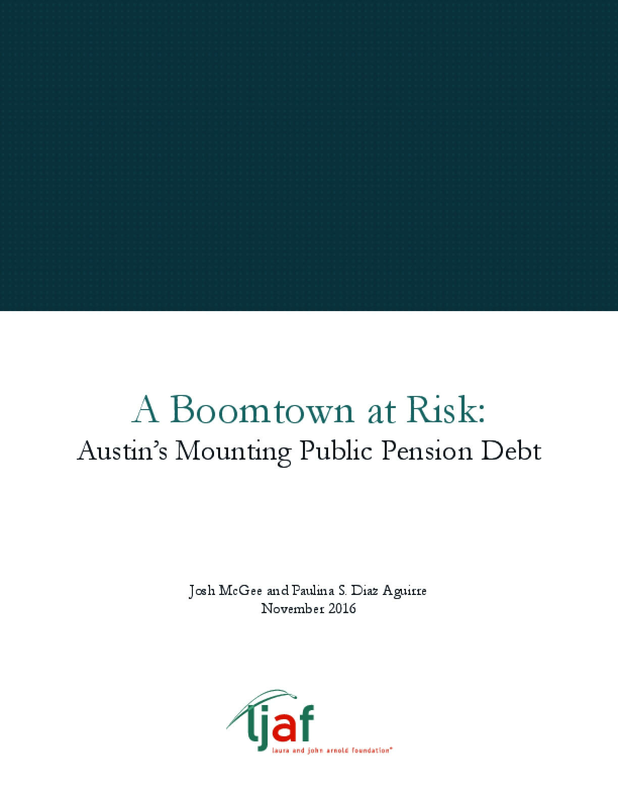 In fact, Austin spends more than half of its pension payments on debt—rather than benefits for public workers. Yet even these payments might not be sufficient to pay off the unfunded liabilities, and if the city earns less than expected on its investments, debt will rapidly rise. The brief explains that the city must take immediate steps to pay down the unfunded liabilities in order to improve the stability of its pension plans. Local leaders in Austin should take note of the pension crisis that is unfolding in Dallas. Two years ago, Dallas' pension system was in a similar position to the one that Austin is currently in. However, Dallas' pension debt doubled to $4 billion and its funded ratio plummeted to 56 percent after the plan administrators made a series of reckless decisions that have pushed the city's largest plan, the police and fire fund, to the brink of bankruptcy. Making adequate funding non-negotiable and committing to pay down current unfunded liabilities in 30 years or less. Establishing prudent and realistic funding and investment policies. Establishing local control of the pension fund in order to improve oversight and accountability. Consider enrolling new workers in plans that are simpler and easier to manage, like Defined Contribution or Cash Balance plans. Copyright 2016 by The Laura and John Arnold Foundation. All rights reserved.